This fantastic sea view studio apartment is on the eighth floor of the Paradise Condominium, is decorated to a high standard and fully furnished. The kitchen area is fully equipped with utensils, pots, pans, cutlery etc; as well as having an electric hob, extractor fan, hot water kettle, toaster and refrigerator. In the good sized living/sleeping area there is a double bed, storage facilities including a large built in double wardrobe and cupboards, drawers and bedside cabinets; a corner sofa, coffee table, and display units along with a flat screen TV with DVD player. There is also access to the balcony, which offers fantastic sea views and is complete with balcony furniture, via large sliding doors. The bathroom, which is fully tiled, features a large marble worktop housing a basin, provides plenty of storage space and contains a large walk in shower. The apartment also benefits from tiled flooring, curtains, down-lighting, air conditioning and ceiling fans throughout. Paradise Condominium is located in a quiet area of Jomtien, at the south end of Jomtien Beach, which is only 200 meters from the building. From here it is easy to catch a Baht Bus into the busier area of Jomtien or Central Pattaya on Jomtien Beach Road. The complex is very well maintained and in a fantastic location. Residents can benefit from many great facilities here, including a very large swimming pool, a tennis court, table tennis, sauna and steam rooms, a fitness center, restaurant, bar, mini-mart and laundry service, along with parking and 24 hour security. 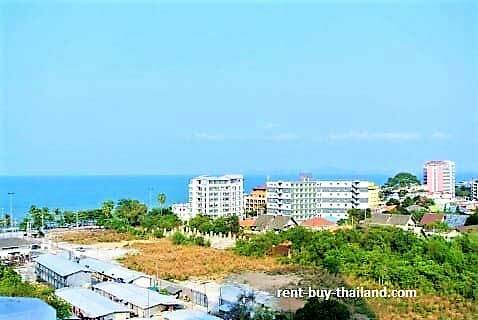 Other sea view studio for sale Pattaya and Jomtien areas, please inquire for further details.